"There is no place like home." California is my home. I can't imagine living anywhere else. My whole Brady Bunch family lives in CA (I have a thousand aunts, uncles, cousins, cross cousins, relatives, etc). And when we get together....it's like a zoo. And I wouldn't have it any other way. I also love the climate in Southern CA (mild winters and hot summers). I love the beaches. I love how everyone is always in a rush (cause I am too lol). I love how we speed walk in the malls (so guilty). I could do without the traffic, road rage, and posh Hollywood scene, but hey....we're not perfect. I can't think of a better way to sport my home pride than with my new Home. T. It's insanely soft and comfortable and has been styled by many fabulous bloggers including Jacey, Caroline, and Samantha. But more importantly, when you buy this t-shirt, a portion of the profits are donated to Multiple Sclerosis (MS) Research. A stylish way to show your state pride and support a good cause....it's a win-win situation, folks! I'm also sporting some new arm candy (and I love it) (finally). Anyways, that's all for today! Thanks for stopping by :)! Love your jeans, you look great!! OMG love those shirts, i want a massachusetts one! also your red bag is so cute! love the sleek lines of this jacket and ur pop of red! gorgeous! Can you believe that I have never been to CA? I want to go so badly! It seems like anytime we take a trip, we just go on a cruise. We need to start planning trips around to other states. I love this t-shirt and I love the entire look. Girl you've got to come to California (at least visit LA & SF)! That blazer fits you perfectly. Love it with your t-shirt. Only been to California once but I loved it. (especially the weather!). I love these tees- I want a NY one! Great jeans!! !I love them....that shirt is incredible too! I love white blazers so much. I finally got one! Love how you added the red bag and lipstick! I'm in love with your bracelet!!! and ur jeans r so cooL! Love your tee! And this white blazer looks so sharp and chic, love it on you! I'm seeing these shirts everywhere - I love them! I wish they came in Canadian provinces. Haha:)! You've got to visit Sharon (especially LA & SF)! Looooove these tees. The only reason I haven't bought one yet is because I can't decide which one I should get - Illinois is my birthplace and "home" but Wisconsin is my college "home" and I love it! Guess I should get both? haha. Love the pairing of the tee with the white blazer! We 100% vote for both! Absolutely love this look, Rita. Very simple, very casual, and super stylish. LOVE this outfit. i'm pretty obsessed with it. that blazer is amazing. Thank you so much Mili:)! Love the style of this outfit. perfect. 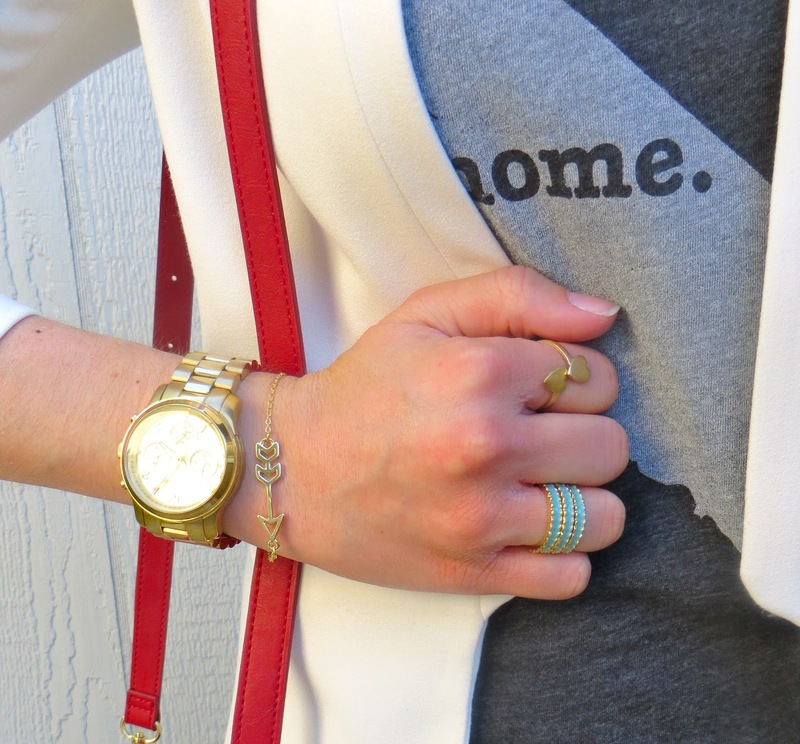 the home tee is too adorable & the white blazer is a great closet staple!!! LOVE LOVE everything. Plus just enjoying that pop of colour with the bag. I love your Jacket so much!!! Lady, red is such a fantastic color on you! You should sport red lipstick all the time. It pops beautifully against your skin and awesome hair. I love that purse and can't believe it's from Forever and adore that t-shirt. I feel the same way about this crazy kooky awesome state we live in. So, in sum, this outfit is one of my favorites - it's tough and chic and put together with just enough the right amount of girly edginess. I've been staying away from white blazers because I'm not sure how to incorporate them into my closet. 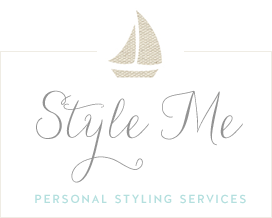 I love you've styled it. Aww thank you so much for the sweet comment Jenny! Yes, I love our crazy kooky awesome state too ;)! You could definitely rock a white blazer girl (especially with your wardrobe)! Thank you so much for sharing The Home T with your readers and helping us raise money for multiple sclerosis research! It's my pleasure! Thank you team Home T:)! I keep seeing these tees and they are so cute. Id love a Tennessee one! You look so cool even when you are wearing a T-shirt! Those tees are so fun! Loving this outfit! I just saw that TShirt featured on anotherblog...but I can't remember which one. So I love red lipstick on you! It looks great! Your accessories are just perfect! I moved recently, but feel like my current state isn't my home, and my 'home state' isn't my home anymore either. Maybe they should make an alternative print, of some abstract shape (or one of a house, haha). 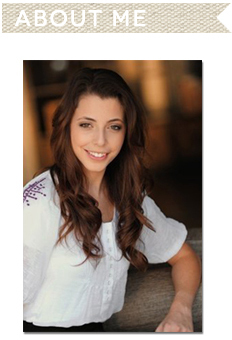 i love the crispness of your white blazer - it has the perfect structure. And those jeans fit you like a glove! Great look all around and what a wonderful tee shirt :) oh and I adore your red accents! you look so beautiful in the second picture! I love your red purse! Fabulous outfit, Rita! I have the same blazer and can't wait for warmer temperatures and finally wear it! I have been looking for a red bag - yours is awesome, I'll have to check it out. Thank you so much for your great support recently!! That was so kind of you. I can't wait to see you style the white blazer, Annette! And no problem...I'm happy to support a fellow blogger any way I can. Looks great!! This whole look is Cali casual, yet chic!! My hubs' is a Cali boy, but would rather raise our kids elsewhere!! We miss it though!! I have been seeing so many state things lately and I love them! 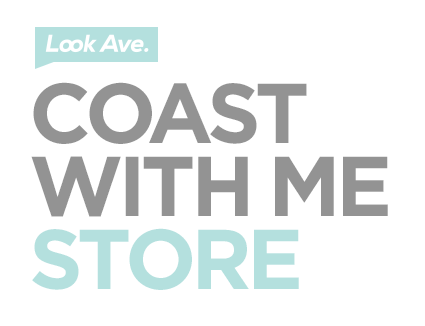 I'll definitely check them out, would love a home T for New Jersey :) Cute fashion , and for a good cause, is my favorite type of fashion! Thank you so much Hannah! I can't wait to see how you style it:)! Lolllll we get those storm watches too...and in Ca it's silly because storm watches mean sprinkles outside lol! P.S. Thanks for the sweet comment:)! Love those jeans! I have one like that and they look so elegant! Haha! That is awesome Lulu! I think we would be great shopping buddies! PS ~ you look amazing in flared jeans! I want that tee! Love it! i LOVE this outfit. The pants were seriously made for you, and the red purse/lips is serious perfection. SERIOUSLY. love. Cute tee, and how great that some of the proceeds are supporting MS research. It's so nice to live near family. Love those rings! Perfect outfit! I consider California to be one of my few homes - I've just fallen in love with this state! There is seriously so much to love about CA:)! Oh wow great styling dear! Lovely! :) Such pants are old school! :) Love it! Love Everything about this outfit Rita! Those jeans make your legs look so long and I love that shade of lipstick on you! I seriously need to be a little more brave with lipstick colors. Thank you so much everyone:)! Rita, you are so right, there is no place like home, no matter where it is. I luv ,luv, luv this look darling!!! Btw. Love what you are doing for M.S. Research. Keep it up Girl! I'm loving that white blazer. This is such an awesome look, love how you described your family , I have a pretty small family so huge families have always fascinated me . 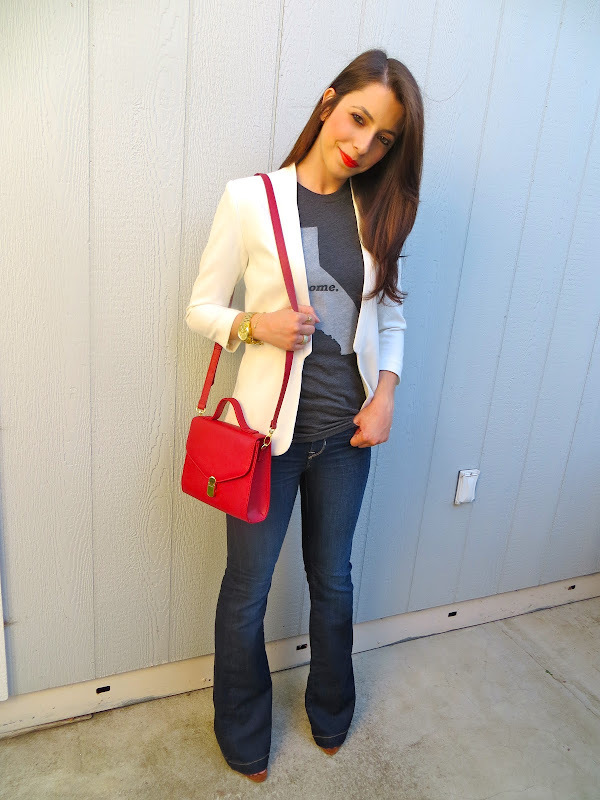 Loving the t.
LOVE that white blazer and red bag - such a fabulous look! This outfit is gorgeous. Love your red lips!!! Don't forget to link up today: show me your favorite spring trend. 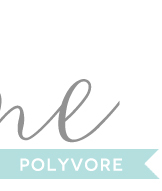 I'm also hosting a giveaways for a $300 gift card to Gap/Old Navy/Banana Republic. Stop by and enter. I'm impressed with Forever 21's bag - it's got great structure to it! And I love that H&M blazer! LOVE the shirt! I've been drooling over the home state necklaces I've seen but haven't seen a tee like this. I love it! I couldn't imagine ever living anywhere other than California either but here I am going on my 9th year in Utah. I dream of going back to CA every day. Gorgeous outfit! Loving the blazer, and that shirt is just so cute! I am a bit envious, my friend that you have So Cal as your hometown.. Me and hub just adore So Cal and wish one day we would be able to call it home too :) Looking gorgeous as always even in simple attire like this! Some of the profits to MS - that's a great idea. I like the red bag - perfect with the outfit. PS:That red lipstick was made for your :-) I LOVE IT! The bag is so cute. I love it :) I think you have the best blazer collection. I don't have a white one and I think yours is flawless. Rita, this is one mindblowing outfit!!! You look gorgeous!!! LOVE! This outfit is perfection!! Thank you all so much for the kind words....means the world to me!!!!! I published my comment but it looks all kinds of screwed up! 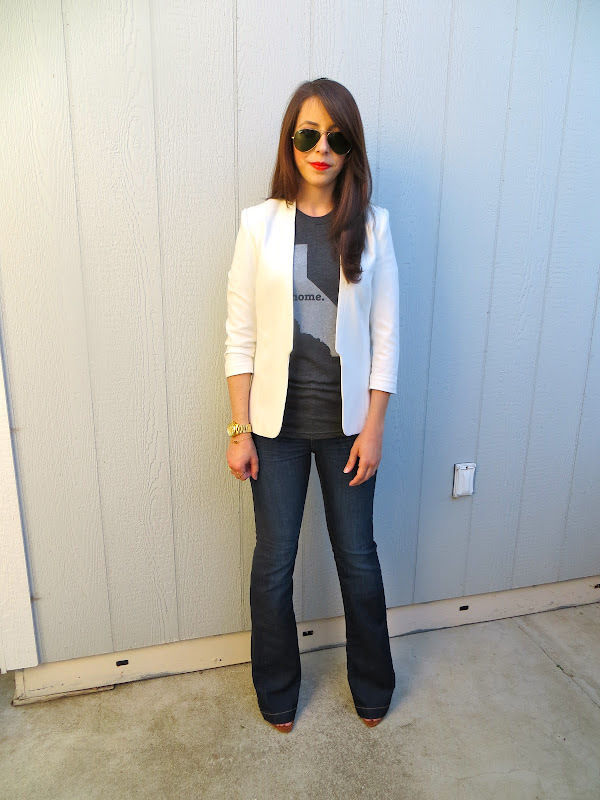 Anyways, I just posted my styled Home T last week, I love the way you paired yours with a sleek white blazer! LOVE THE BAG!! A pop of red is the PERFECT addition to any and every outfit in my opinion (: I need to go to Forever ASAP it looks like! Thanks Megan! I will definitely visit your blog:)!